I love to eat healthy real food EVERY day, but I don’t always feel like cooking. Some days are just busy and hectic, and I just want dinner on the table. 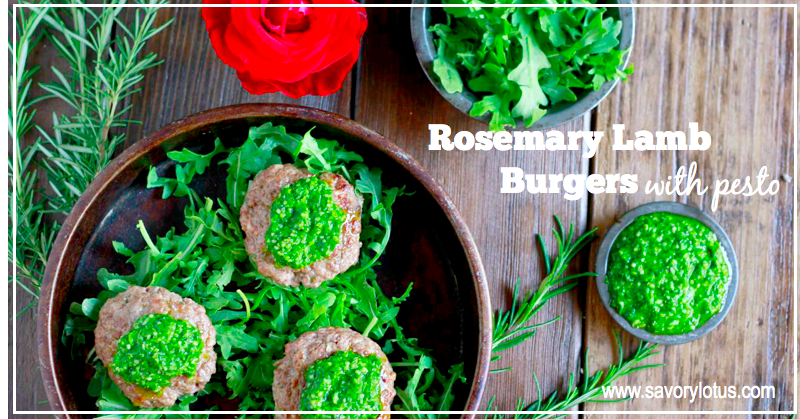 That’s when I make these super easy Rosemary Lamb Burgers. I’m always trying to create simple recipe that make my life in the kitchen easier. If I can bust out a gourmet-tasting meal in under 30 minutes, I’m feeling good. That’s where burger come in. So when I got some fresh, local ground lamb in my meat CSA box this week, I knew exactly what I was making. 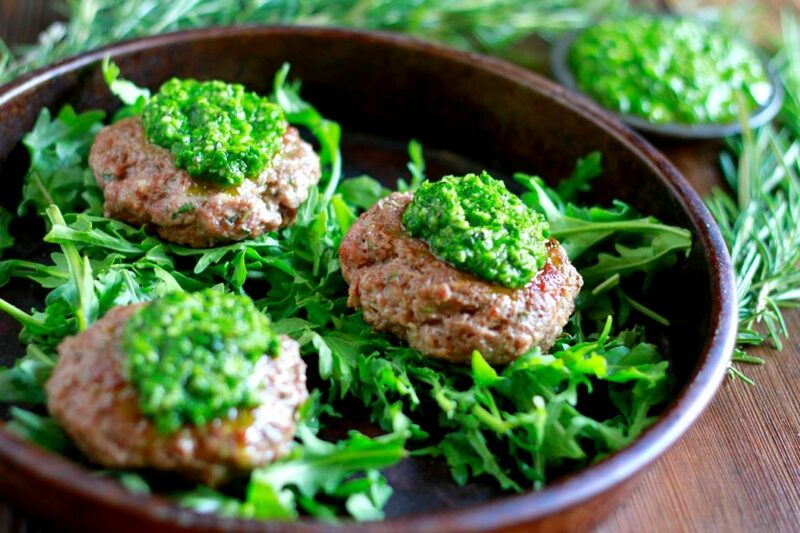 This is my version of the bomb lamb burger: Rosemary Lamb Burger with Pesto. And pesto. It makes everything better. It turned this awesome burger into a gourmet burger. Mix ground lamb, rosemary, and salt until thoroughly combined. (I use my hands here) And form into 1 inch thick patties. 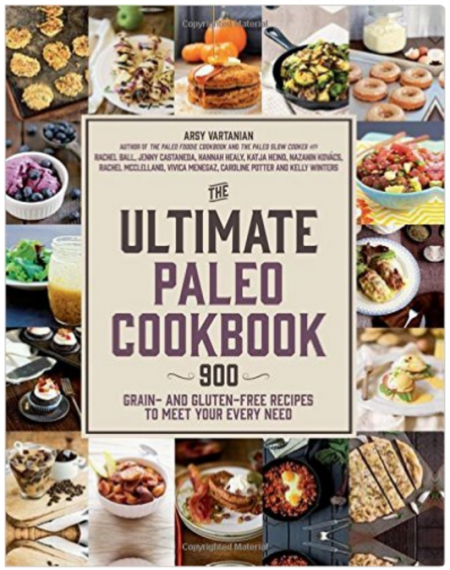 Melt fat of choice in skillet over medium-high heat. Cook patties, flipping once, until browned and cooked to desired doneness. I cook mine about 4-5 minutes on each side. Meanwhile, place basil, olive oil, lemon, garlic, and salt into a food processor. Process until you achieve a smooth texture. You will need to scrape the sides a few times. Then add the hemp seeds (or pumpkin seeds) and pulse until desired pesto consistency. Adjust for salt and lemon. Toss your salad greens in a titch of olive oil, white wine vinegar, and salt and pepper. Place your lamb burger on top. Add a dollop of pesto. ENJOY! Do you have a favorite burger? Tell me about it in the comments! Delicious! Made this for dinner last night and will make it again. Thanks! 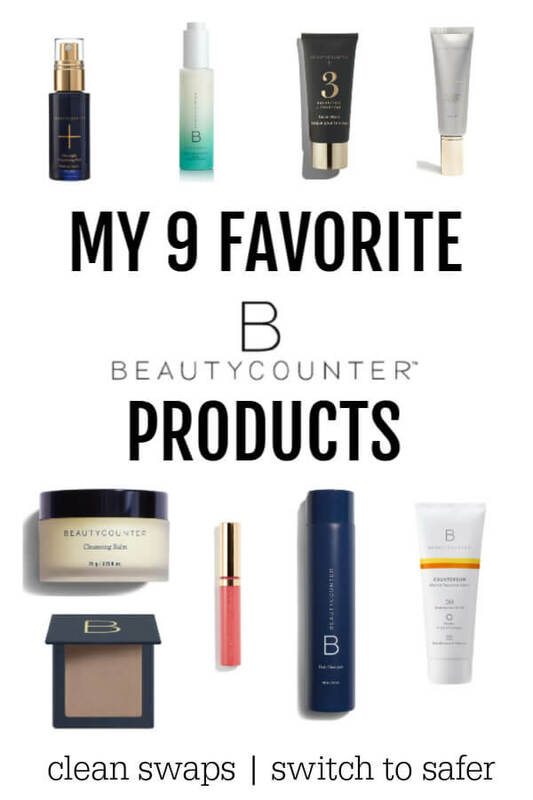 I am so happy to hear that you liked it. 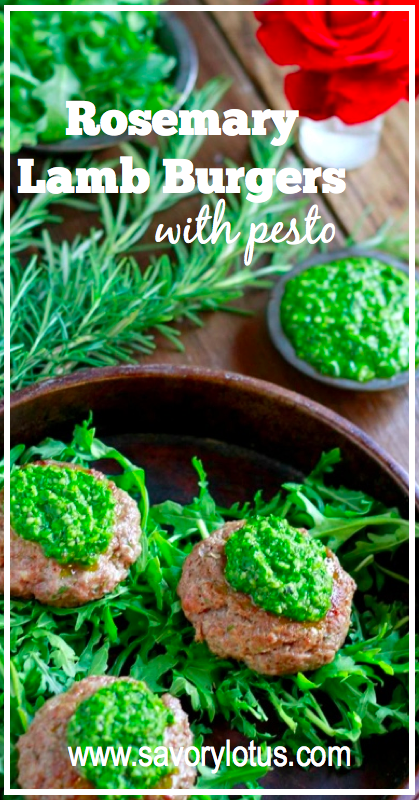 I love lamb burgers, especially with this pesto. 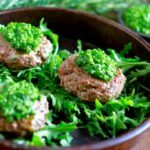 This is an amazing recipe, so simple but so tasty! Thanks Katja!